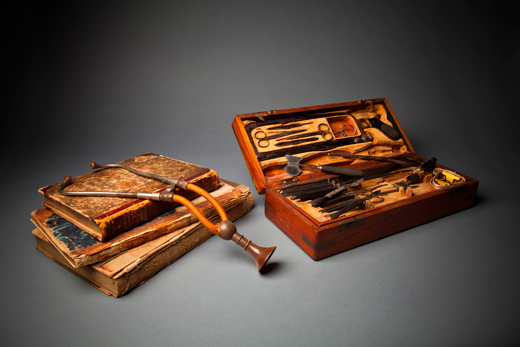 A binaural stethoscope circa 1860 and a Civil War surgeon's kit, which includes several types of bone saws, bullet forceps, knives and other instruments primarily used for amputations. Photo by Woodruff Health Sciences Center Library, Emory University. Have a peek at some of the treasures - objects & images - on display. 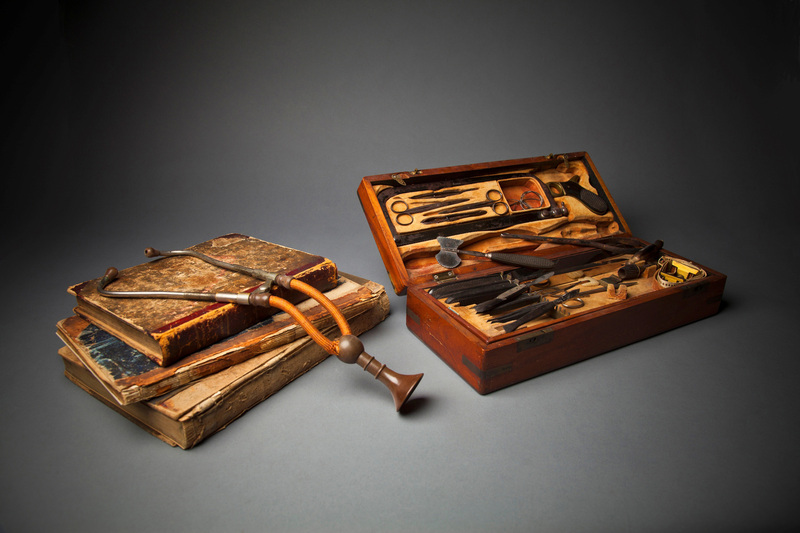 Robert Gaynes discusses "de humani corporis fabrica"
An opening reception for the "Medical Treasures at Emory" exhibition will be held at 5 p.m. on Friday, May 17 in the Woodruff Health Sciences Center Library, 1462 Clifton Rd. NE in Atlanta. "Medical Treasures at Emory," an exhibition of intriguing historical medical books and artifacts, is now open at Emory University's Woodruff Health Sciences Center Library (WHSCL) – a reminder of the days when doctors had a rudimentary understanding of human anatomy, performed surgery without antiseptic, and used primitive forms of anesthesia for operations and dental work. An opening reception will be held at 5 p.m. Friday, May 17, when the American Association for the History of Medicine, in town for a conference at the Emory Conference Center, will visit the exhibition. "Medical Treasures," on display through October 2013, features materials from the WHSCL's historical collections, which include 18th- and 19th-century works on human anatomy, pathology, surgery, midwifery and alternative medical practices. Robert Gaynes, MD, professor of medicine (infectious diseases) at Emory University School of Medicine and author of the book "Germ Theory: Medical Pioneers in Infectious Diseases," is the exhibition curator with Matt Miller, a resources management senior specialist at the WHSCL who earned his PhD in American Studies from Emory's Graduate Institute of Liberal Arts. "Emory has some really remarkable books and artifacts on the history of medicine, especially from the 1800s, when modern medicine got its start," Gaynes says. This is the first major exhibition for WHSCL, says Sandra Franklin, the library's director. "It's really exciting for us to give visibility to our treasures," she says. "Among the materials in our historical collections, we didn't realize the importance of what have. The rareness of some of the pieces is amazing." Notable artifacts in the exhibition include one of the earliest stethoscopes from the 19th century, and a kit of Civil War surgeon's instruments, primarily used for amputation. "They're pretty grisly-looking, especially when you realize this was the last great military conflict prior to the use of antiseptic," Gaynes says. "Surgeries were performed in terribly unclean conditions. Many soldiers died not in battle but from infection." Materials related to the discovery of anesthesia are also part of the exhibition, including the notes of Crawford W. Long, the Georgia physician for whom Emory University Hospital Midtown was originally named. The notes, from the collection of Emory's Manuscript, Archives and Rare Book Library (MARBL), provide proof that Long had already introduced ether anesthesia before its first documented use at Massachusetts General Hospital in 1846. "That's rather exciting. These are important historical notes on the first use of ether anesthesia," Gaynes says. "There was a great deal of debate in the 19th century that lasted over 20 years, and these documents helped to settle that debate." Most of the materials on display are historical medical books. Among these volumes: books about Civil War field surgery practices, an 1881 book that incorporates early medical photography to show the ravages of syphilis, a copy of "Notes on Nursing: What It is, and What It Is Not" (1865) by Florence Nightingale, and an 1849 obstetrics book by Charles D. Meigs, an obstetrician and professor of obstetrics who opposed obstetrical anesthesia and the introduction of sanitary practices during childbirth on the theory that "doctors are gentlemen and a gentleman's hands are clean." The last exhibition case is dedicated to a significant medical book: "de humani corporis fabrica" (On the structure of the human body), first published by Andreas Vesalius in 1543. It is considered the first accurate book on human anatomy; until its debut, changes in medical discoveries moved incredibly slowly and closely followed the second-century writings of Galen, Gaynes says. This version, part of the WHSCL's historical collection, is the oldest book housed in MARBL. The Emory volume is thought to be a variation published between the first edition (1543) and the second (1551), and one of only 60 copies in existence. The book, printed on linen pages, has 11 full-page plates of figures that are "astonishing in their details," Gaynes says. An article on display describes how Emory librarian Myrtle Tye managed to purchase the book in 1930 with donations she raised during the Great Depression. "It's one of the most important books in the history of medicine," Gaynes says. "It corrected errors in Galen's theories and brought about changes in modern medicine. It's a privilege to see it and to display it." Some of the rare books on display have been scanned through the Emory Libraries' digitization program, and visitors will be able to "page through" these treasures, physically kept under glass, via a kiosk in the exhibition. Franklin says the library staff is pleased to share materials from its small historical collection with the Emory community and the general public. Most of the materials were acquired over the years through donations. "We're proud of our historical collection and happy that we were able to maintain and secure the items all these years until we could display them properly," Franklin says. WHSCL is located at 1462 Clifton Rd. The library's webpage provides links to directions, parking, hours and maps.